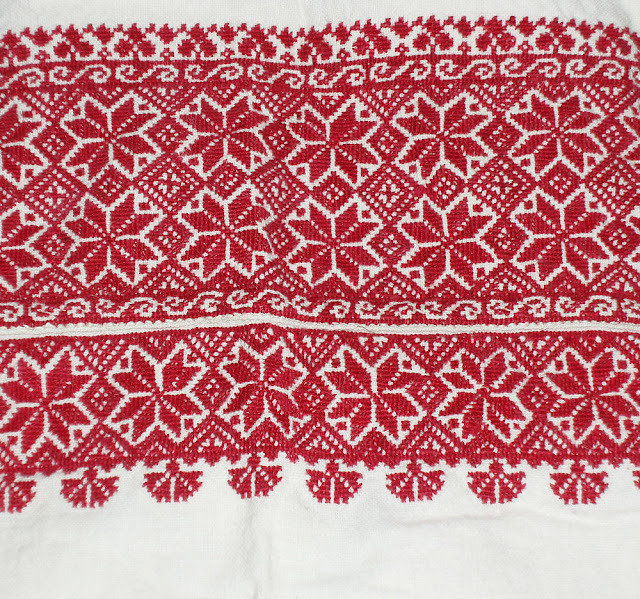 A while ago I did an article on the white embroidery of the Sniatyn district, and I mentioned that there are other types of embroidery in that area. This is one of them, This type of chemise is called rukavianka-chervonianka, which more or less means 'red sleeves'. 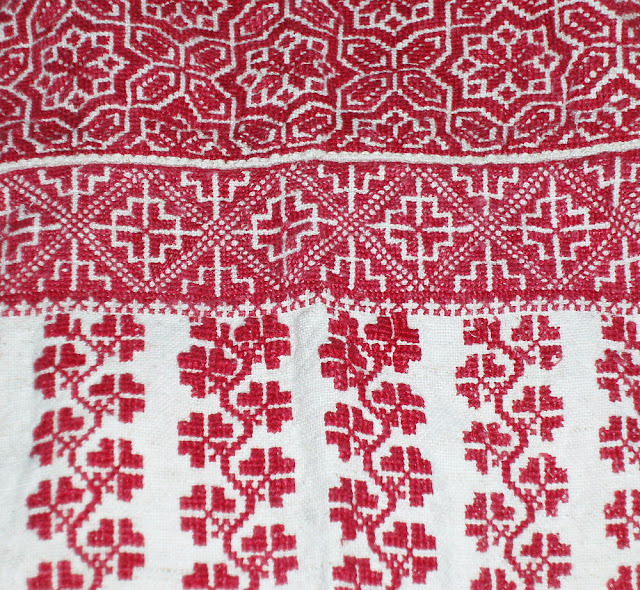 There are yet other types of embroidery found in this district, some of them restricted to just one village. 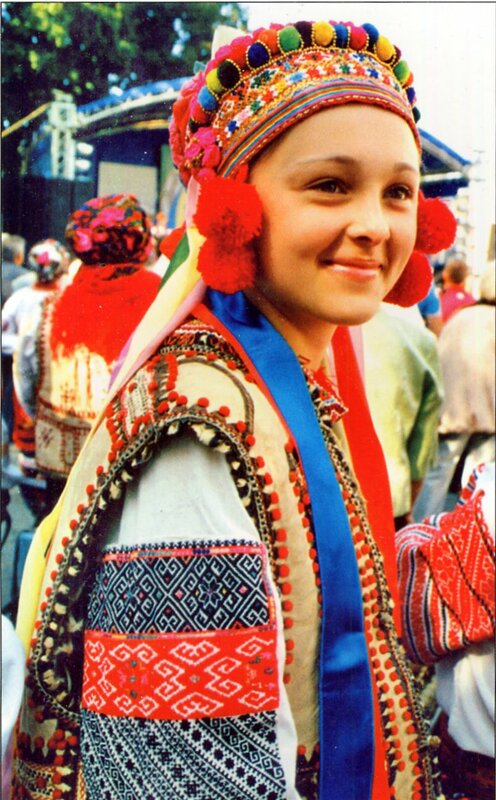 This girl is wearing her grandmother's costume from the village of Pidvysoke. Some villages in this area have local folklore groups and/or tiny school museums which keep the memory of the local traditions alive. Other villages have lost their local traditions. Many valuable pieces have been bought up by collectors from the west, who often do not bother to note the exact origin of the various pieces, and by the lack of interest of the local people. 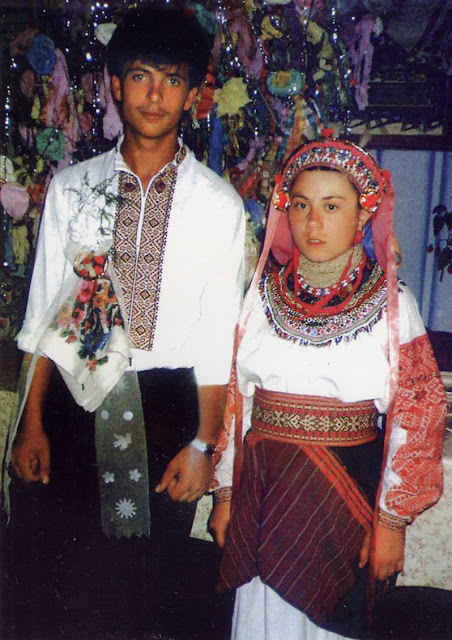 Here is an example of a wedding also in the village of Pidvysoke. 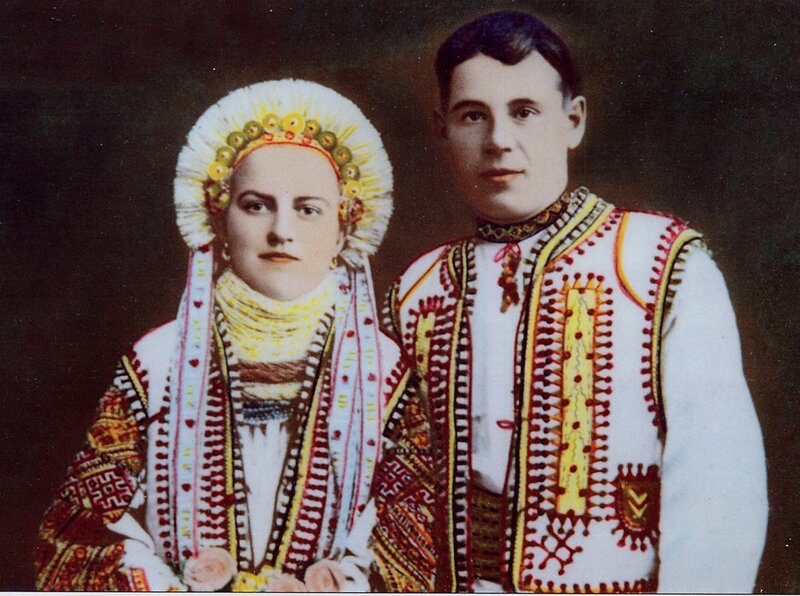 The bride is wearing the traditional wedding outfit of the village, while the groom is wearing contemporary pan-Ukrainian clothing, which, you will notice, still includes a hand embroidered shirt. You will notice that this is essentially the same costume which I described in my article on Sniatyn whitework. Long chemise with embroidered sleeves, Wrap around overskirt in the shape of a rectangle, black in the center and with red woven stripes at each end held in place by a relatively wide sash, similar to that worn by Hutsuls. For a festive occasion it is accompanied by a wreath and many necklaces. Here is a variant which is shared by the Horoden'ka district just to the north. A wide stiff sash is held in place by a narrower one. 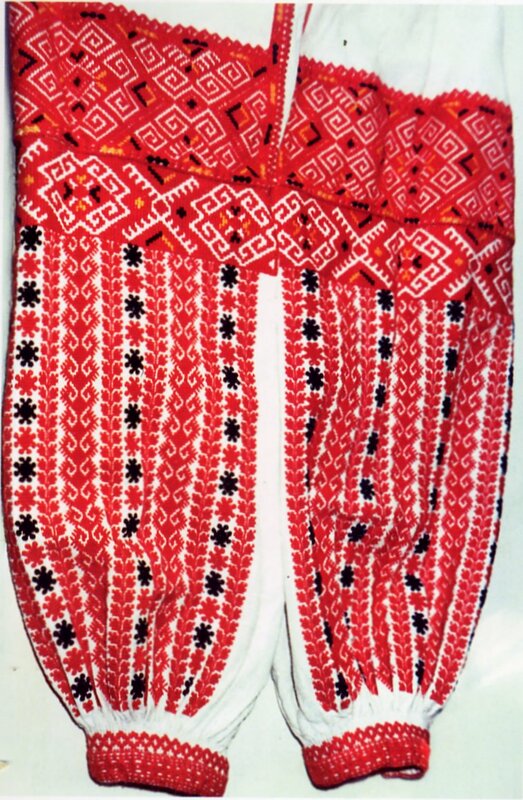 This is also found in the costume of Dubrovnik in Dalmatia. This girl is only wearing a beaded headband and just one necklace. 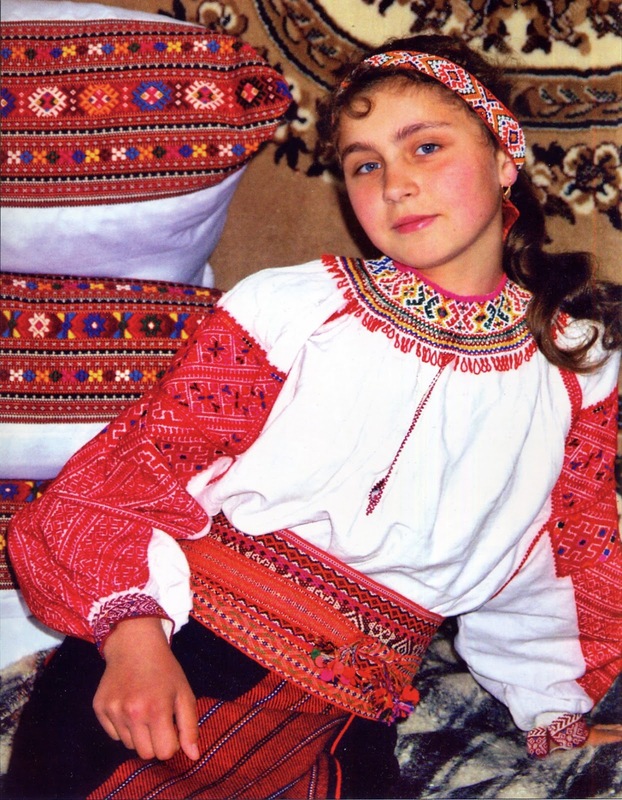 She is from the village of Rusiw. 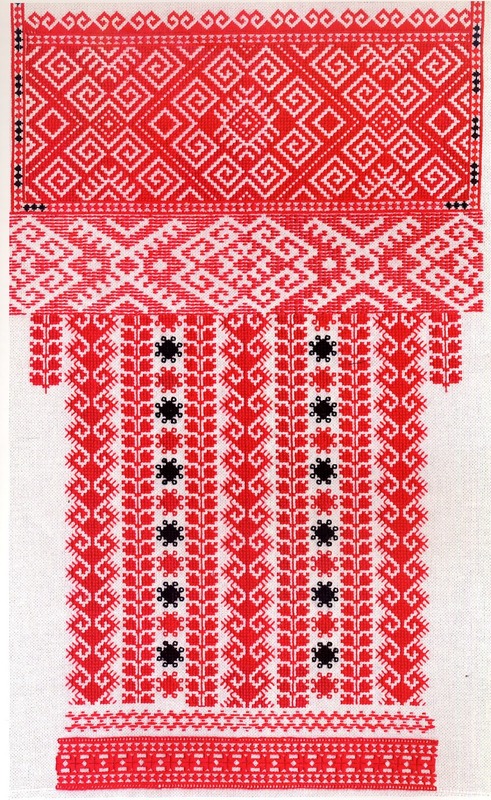 In this article I am relying heavily on the work of Iryna Svyontek in her latest book 'Pokuttia Embroideries of Precarpathian Region'. The first of three volumes has just been published, and let us hope that she will able to finish this valuable work. 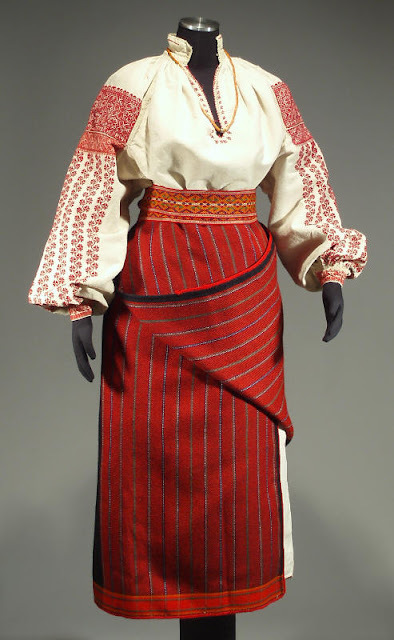 This exact type of costume is also found in the village of Toporiwtsi, which is technically just over the line in Horoden'ka district, to the north. Here is an old plate showing the costume of Tulukiw village. 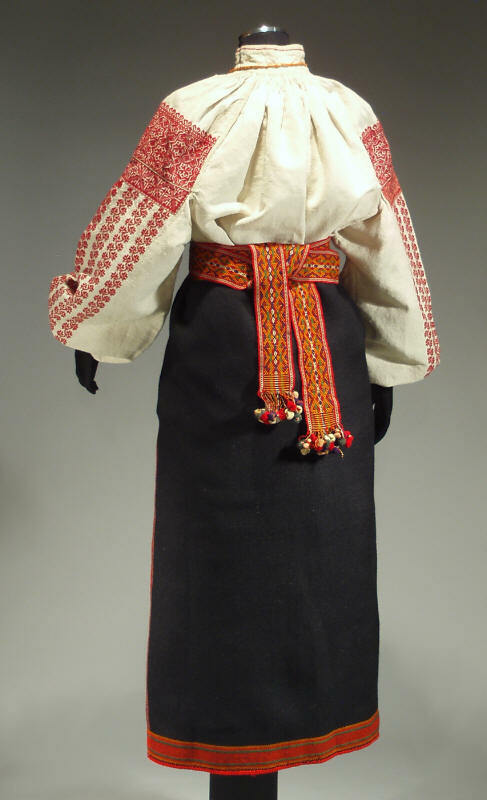 Here is a costume in the collection of Jan Letowski. His information is that it is from the village of Zaluchchya, which is in the Kolomyja district, which lies just to the west. I wonder if it is not actually from the village of Upper Zaluchchya, which is in the middle of Sniatyn district. On the other hand, the two villages are only 30 km apart. To see more of the exquisite folk art and costume items which he has available, visit his webstore EasternEuropeanArt. You will notice that these chemises participate in the three-part canon of the general area. 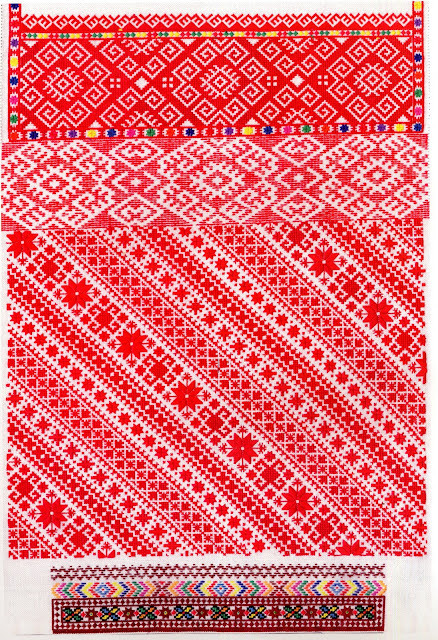 The top part is embroidered onto a rectangular piec which is sewn to the side of the body panel. 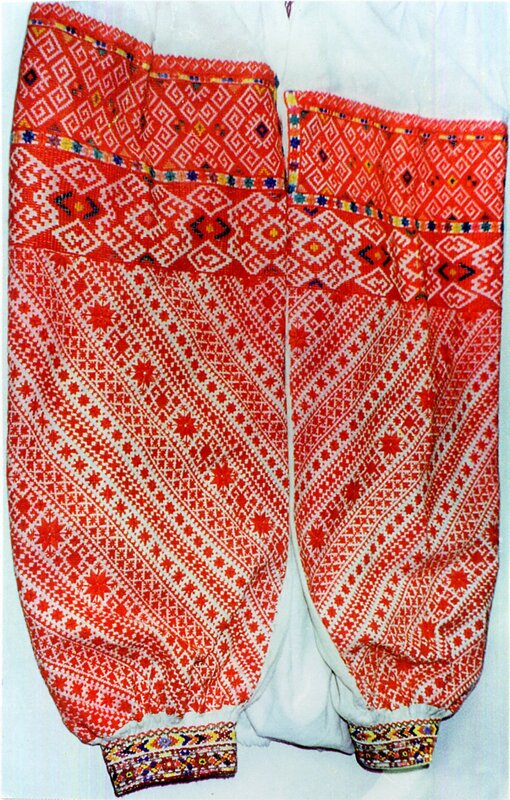 This is called 'plechyk'. 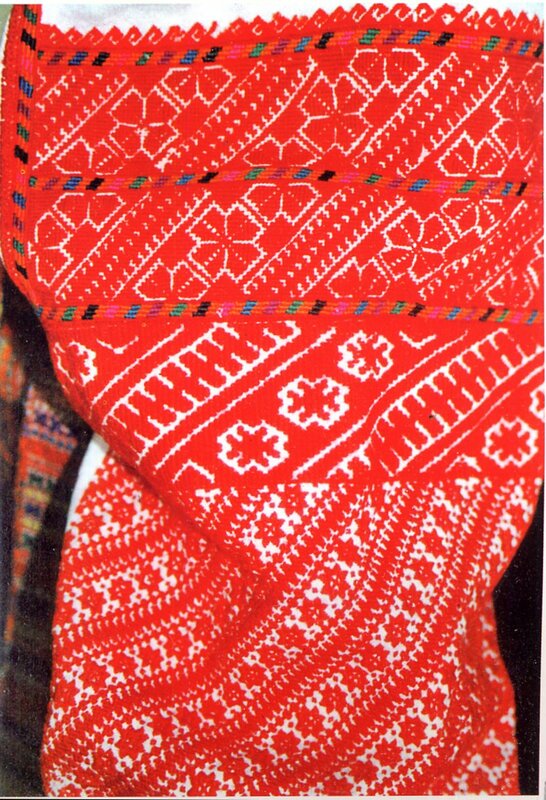 The center band is called 'morshchinka', after the type of embroidery most commonly used, and the bottom part is called 'rukav'. Both the second and third are sewn onto the sleeve itself, which is a separate piece of cloth sewn onto the bottom edge of the shoulder inset. Here is a girl from the village of Hlushkiw wearing a chemise which is a bit too big for her. Notice that the shoulder inset has a separate border design which goes around three sides. Here is a closeup of the shoulder and sleeve. 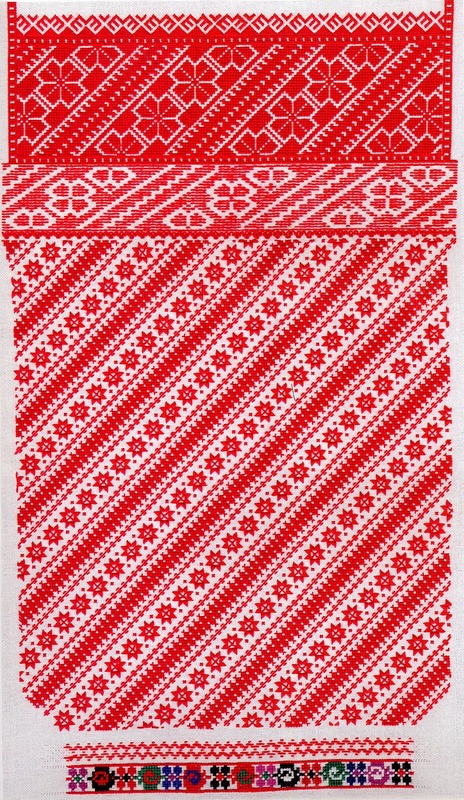 The top part is executed in cross-stitch, the second in morshchinka or kafasor, and the bottom in cross stitch and counted satin stitch. Here is another chemise with a very similar design. This girl is from the village of Pidvysoke. The embroidery is mostly done in red wool, with a somewhat thick thread which results in the embroidery standing out from the background. Here is a closeup. This embroidery is done over three pieces of the chemise. 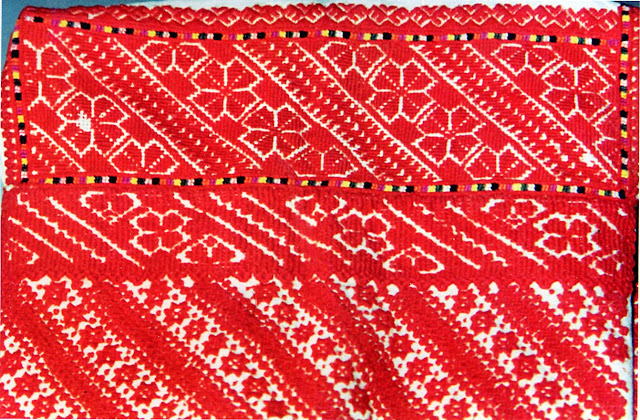 The top is embroidered on the shoulder inset, the second band and the diagonals are done on the sleeve, the bottom band is the cuff, and the embroidery just above it is done over the smocking which gathers the sleeve into the cuff. There are many such examples in Ms. Svyontek's book. This is part of what makes it such a valuable resource. Here is a closeup and schematic of the chemise being worn in the bridal picture at the head of the article. 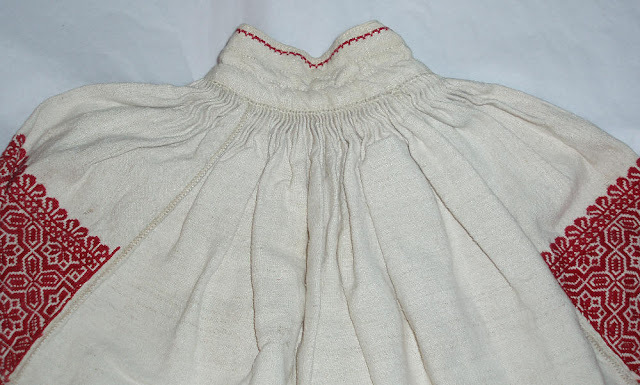 Again, this shows the shoulder inset, the sleeve, the smocking and the cuff. 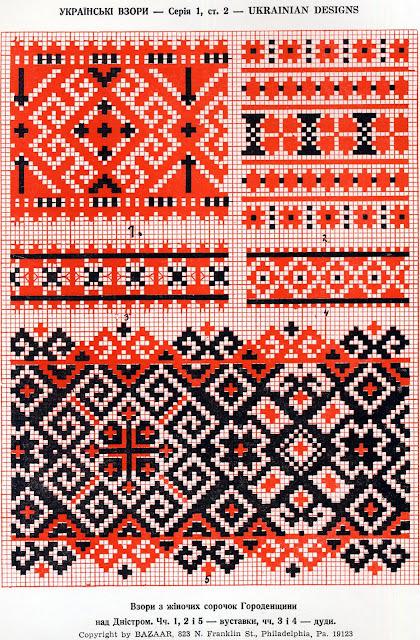 The inset design is done in cross stitch, but it looks like it was originally done in Nyz. Sometimes black is included in the design. Here is another chemise from Pidvysoke with vertical stripes. Sometimes black takes a more dominant role in the embroidery. Here is a closeup of the embroidery of the costume shown above in the collection of Jan Letowski. Sometimes, especially for chemises worn by older women, the third part of the embroidery is omitted. 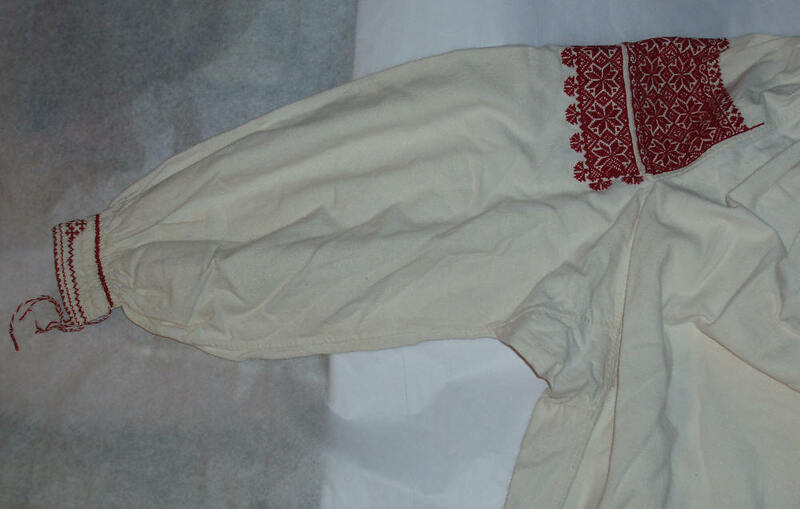 Here is another chemise from the collection of Jan Letowski. These images help to see the construction of the chemises. 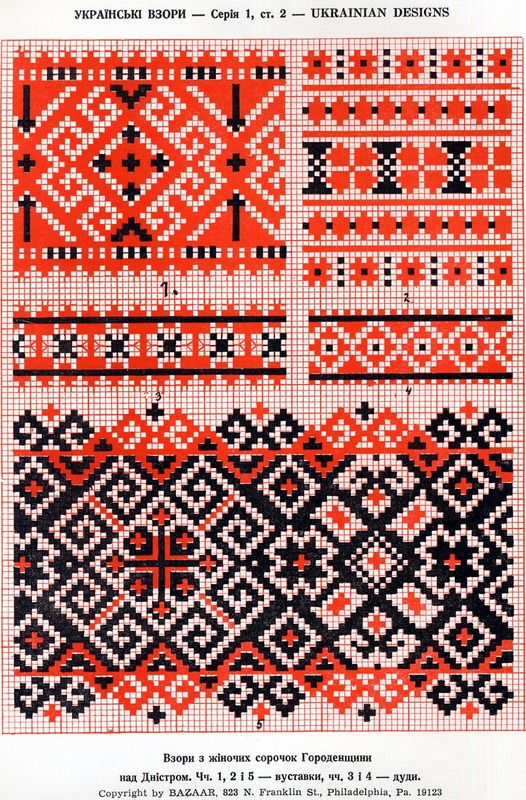 Here are similar designs which were published by Bazaar. 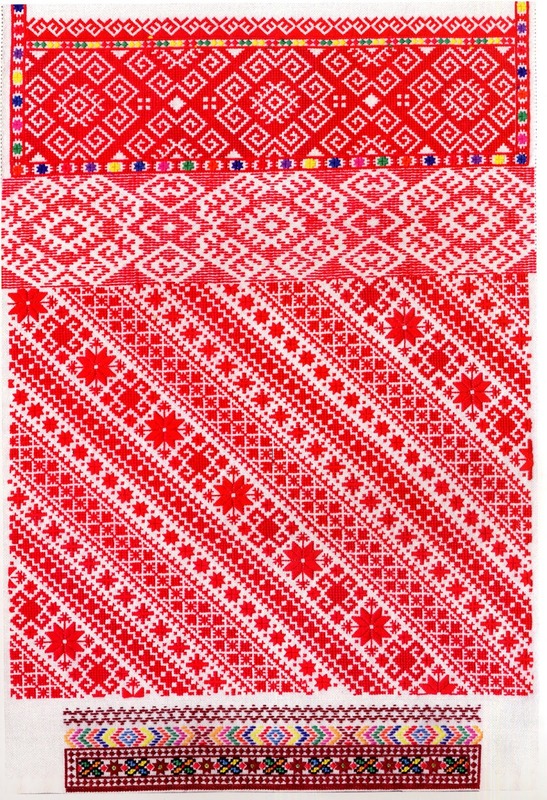 The top left and bottom designs are from the shoulder insets, the middle two are from cuffs, and the upper right design is from the lower sleeve. 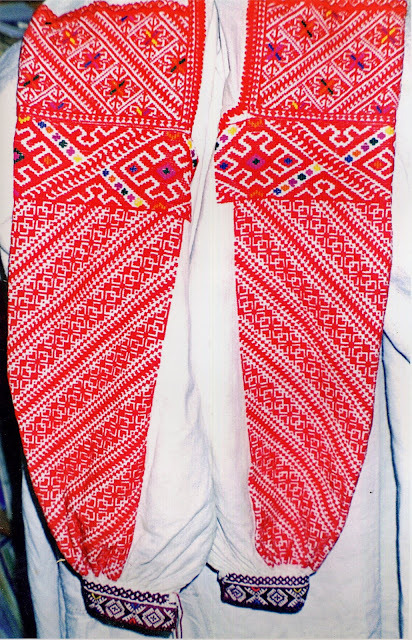 One more image of a chemise from Rusiw village. The cuffs on this chemise are executed in Nyz. Here is a closeup of another such cuff, courtesey of Vasyl Jula. 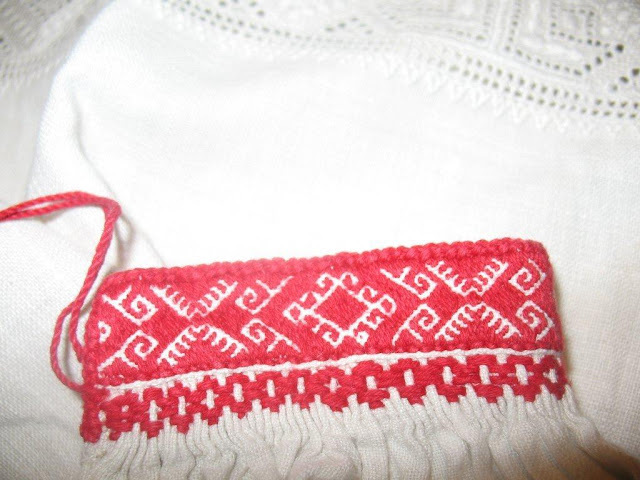 This cuff is on a chemise embroidered in white. Thank you for reading, I hope that you have found this interesting and inspiring. Maybe you will use some of these designs in your projects. One last photo of a wedding from 1936. 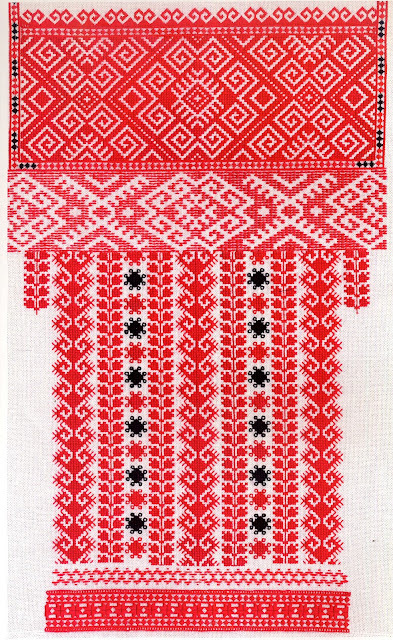 Iryna Svyontek's book on Pokuttian Embroidery is available from this website. 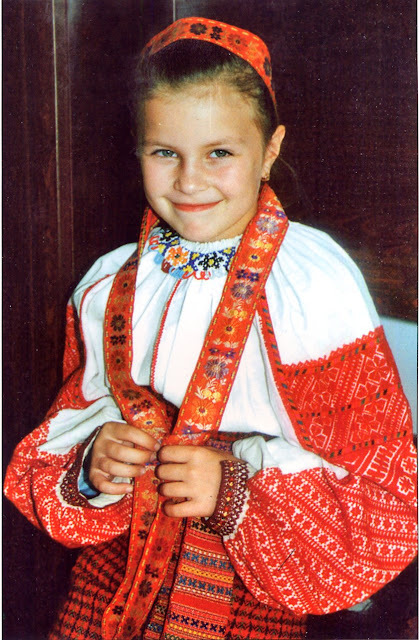 For other books and many beautiful costumes, visit the website of Jan Letowski. What a fascinating site. 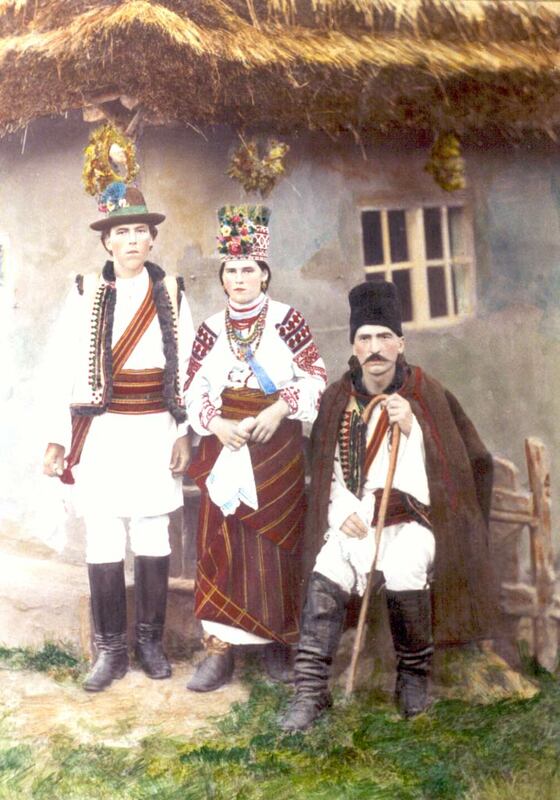 I'm not quite sure how I got here but it was in the course of trying to find out information about Bukovina as well as Sniatyn -- my paternal grandfather came from the former but had family connections with the latter. 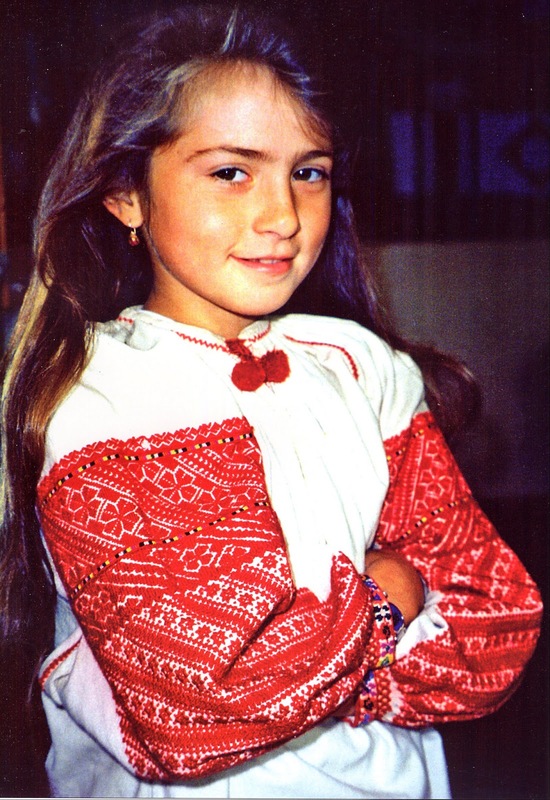 I have two photographs I am trying to decode, of young women in embroidered blouses, and the photographs in this particular post make me feel that I might be getting closer. Thank you. i would be glad to look at them and see if i can tell.